What is FLENJ and what can it do for you? FLENJ is a non-profit organization that promotes excellence in world language education, by advancing both policy and practice. FLENJ advances sound public policy on world language education in New Jersey and nationally. FLENJ makes sure that policymakers know how important the study of languages is—for ALL children, beginning in kindergarten. FLENJ helps you, as a professional, stay informed about national trends in world language education. FLENJ advances world language teaching practice by offering you so many opportunities to network at conferences and workshops. 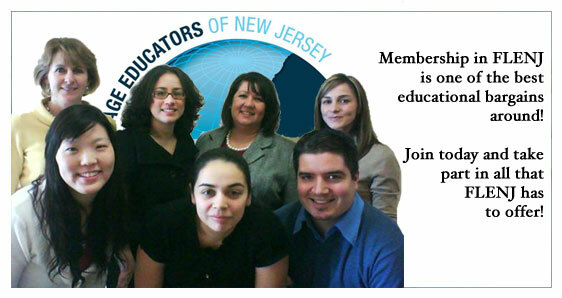 FLENJ offers you professional development that will help you in the classroom. What are the benefits of joining FLENJ?